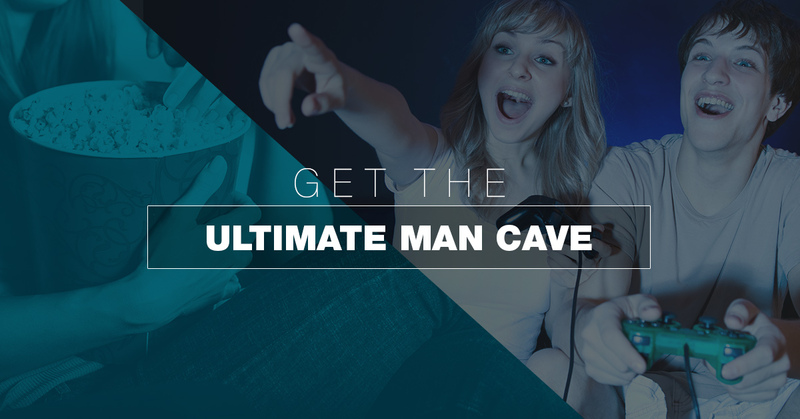 You’ve finally decided to create the man cave of your dreams. Unfortunately, it can be overwhelming thinking of all the possibilities and what exactly the finished product will look like. While a project like this can be of the DIY variety, you want your personal space to be done right the first time. That’s where our luxury home theater professionals at Texas Info Media come into play. In this blog post, we will go through our tips for building the ultimate man cave and explain how we can handle your project. According to this guide from the DIY Network, step one involves taking the time to walk through the space and visualize what you want your space to look like. It’s important to be realistic as you assess the room and function. Pick an object (football, pool table, etc.) that you can make your inspiration in choosing the overall look and color of the space. You’re ready for measurements at this point. Be sure to record the length, width, and height. For visual folks in particular, putting these measurements on paper will be more than helpful during the process. List all the materials necessary to complete the project. In the article, it’s advised that you leave up to a 15 percent allowance for unforeseen costs. Be sure you have the required tools. One area you can really save with your luxury home cinema project is by borrowing tools from friends and family or simply renting from a home improvement store. Should your build require plumbing, electrical, or HVAC work, hire a professional. The last thing you want is to try to tackle something you aren’t familiar with and cause damage to your home. Once your plan is finalized and you have the proper tools, make a step-by-step list of what needs to be done. It’s important to loop in your contractor with this so there’s no confusion during the process. Ask others for help. Even if you consider yourself to be pretty handy, there will likely be tasks along the way that require a second person. Stay on top of your project. It’s easy to get stuck at some point and not come back to your home theater project for weeks, months, or even years. With all the time and effort you put into this, you want to complete it. Give it your own personal touch. The best part about a man cave is that it reflects who you are. Do you love music? Then the space should have killer acoustics. Are you a sports junkie? Then maybe consider some pieces of memorabilia to make it truly you. We’ve seen many homeowners create man caves of their own that look great. But if you want to take your luxury home cinema to the next level, you’ve got to check out the high-end home theater systems available with Texas Info Media. Our team can easily bring the movie theater experience home to you. The professional home theater installation from Texas Info Media is second to none. We work through the entire process, which includes consultation, floor plan design, product layout design, installation, calibration, seating, and acoustic treatments. We go above and beyond, allowing our customers to enjoy the best home theater systems in the world. Call today for a project estimate.